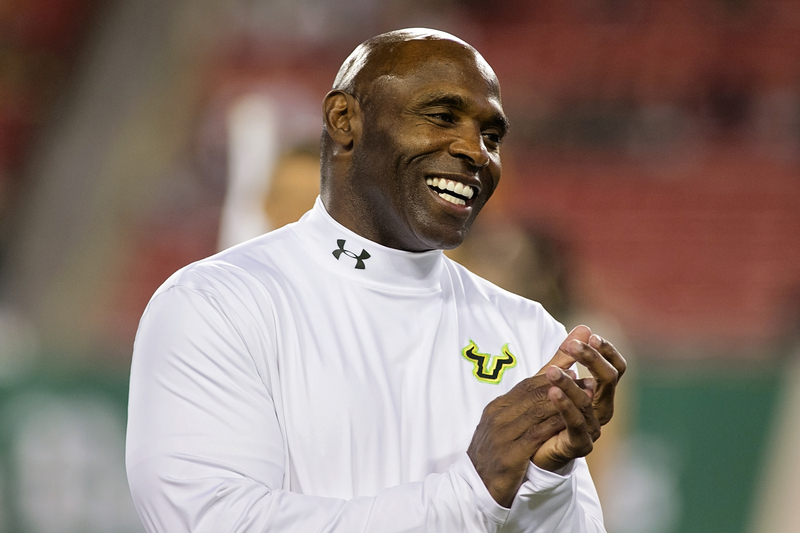 Give a little credit to the USF Bulls. In the middle of a game of football, the team finds a little time to play with fire. They flirted with disaster against Georgia Tech. They wooed it against Illinois. They whispered sweet nothings against East Carolina. And darned if they didn't go down on a bended knee to UMass. They lead the league in shooting at their own feet. They walk under ladders. They skate onto thin ice. Also, they are courting disaster. For a team that is 5-0 and has entered the Top 25, there is not an undefeated air to these Bulls. They've won, but they've done it with a series of narrow escapes. This week, on Friday night ay Tulsa, may be no different. Of course, Tulsa isn't exactly a world-beater, either. After a close loss to Texas, Tulsa has lost three more in a row and stands 1-4 on the season. It's doubtful the Golden Hurricane has the speed to hang with USF. The question is, can USF stop Tulsa. So far, there is no evidence of it. Prediction: USF 40, Tulsa 35. Florida at Vanderbilt: The Gators have grown mightily since their loss to Kentucky earlier in the season. They've discovered their defense, and they've found success when they play around it. Vandy isn't a terrible ball club, but it's going to be tough for them to score. Prediction: Florida 20, Vanderbilt 10. Miami at Virginia: For the Hurricanes, the issue is to retain focus the week following its big comeback win against Florida State. That might cause some stress early, but it shouldn't hold up for the whole game. Look for quarterback N'Kosi Perry to have his best game. Prediction: Miami 35, Virginia 21. UCF at Memphis: The Knights face a troubling Memphis team, one that has scored 40 points or more in five of their six games. It's doubtful that that will be enough to slow UCF and quarterback McKenzie Milton, however. Prediction: UCF 49, Memphis 38. Middle Tennessee at Florida International: The Owls can take over first place in the Conference USA's Eastern division if they can win this one, but to do so, they'll have to stop MTSU quarterback Brent Stockstill. The Panthers are home, which could make the difference. Prediction: FIU 26, Middle Tennesse 25. Tampa Bay at Atlanta: Sure, the Bucs need this game, but so do the Falcons. Julio Jones doesn't always light up the Bucs but he's capable against this secondary. If the Bucs can run, they can pull off an upset. Prediction: Atlanta 27, Tampa Bay 24. Pittsburgh at Cincinnati: The Bengals have played well this year, but against the Steelers, they'll face a hungry team. Look for Ben Roethlisberger to be the difference late in the game. Chicago at Miami: Was the Bears' success all because of a weak Bucs' opponent? The Bears will have a little more trouble against Miami, but can the Dolphins stop Khalil Mack? Prediction: Chicago 24, Miami 17. Rams at Broncos: Denver is tough to beat at home. But the Rams are playing as well as anyone in the league. The difference should be the Rams' defense against Denver's offense. Prediction: Los Angeles 28, Denver 24. Kansas City at New England: Patrick Mahomes has been the best player in the NFL through five weeks, but this one will test his readiness. New England has lost twice, but with Bill Belichick and Tom Brady, they won't lose many more. This one should be tough, though. Prediction: Patriots 24, Kansas City 21. Previous post: Can Bucs withstand Atlanta’s passing attack?